Hi guys! Who doesn’t love a good combo of different kinds of chocolate? It’s really undeniable, these things are pretty fantastic. I just got my wisdom teeth removed this weekend, so my ability to eat normal food has been temporarily suspended, so a dessert like this is exactly what I needed. The great thing about parfaits, or their larger counter-part, trifles, is that you can really put whatever the heck you want in there. I basically always like to have several different textures, with at least one solid item like cake, brownies, or fruit. My original plan was actually to make a full on trifle, but I couldn’t locate my trifle dish. It’s cool, mason jars are cute, amiright? Plus it makes a bunch of single-serve desserts, generous single servings at that. I don’t know about you, but I love it when I don’t have to share my dessert. 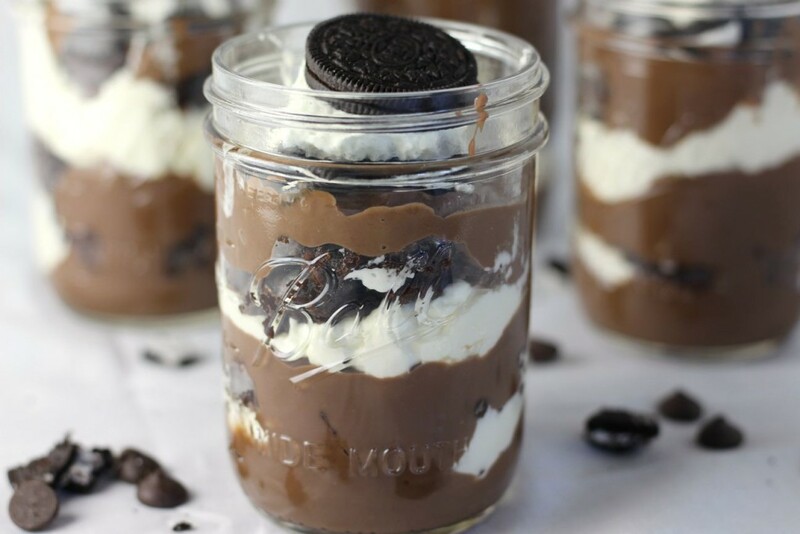 Basically, this particular parfait recipe is made up of some of my favorite staple recipes; chocolate pudding, brownies, whipped cream, plus Oreo cookies. If you’ve never made your own chocolate pudding, today’s the day to start- it’s really quite easy, and it tastes amazing. If you’ve never made homemade whipped cream, you may have never known real love. 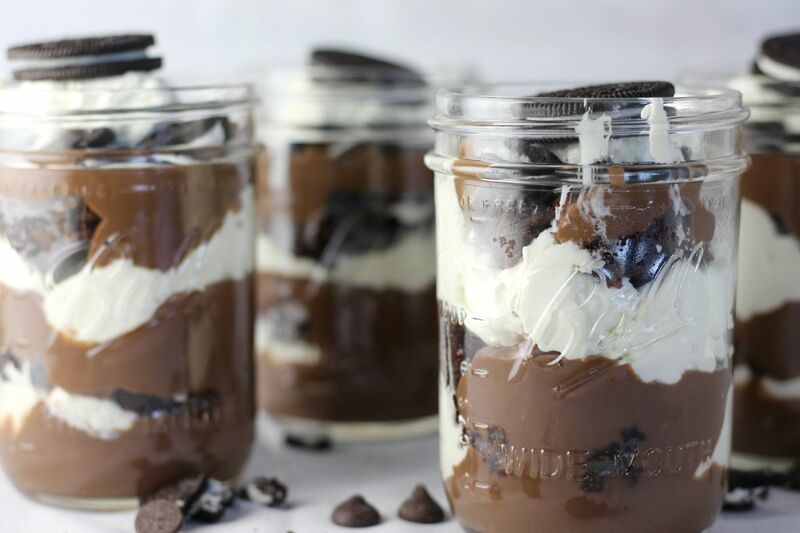 Here’s the breakdown of my favorite recipes that I put together in these pretty parfaits- layer in some chocolate pudding, a little whipped cream, brownie chunks, Oreo chunks, and repeat the whole thing until your jars are full. Share them with your friends, or hoard them in your fridge for your own enjoyment! In a medium saucepan, mix together the sugar, cornstarch, and salt. In a separate bowl, whisk together the egg yolks, milk, cream, and vanilla. Whisk the milk mixture into the sugar mixture. Cook on medium heat until thick, whisking constantly. Remove from heat and whisk in the chocolate and butter until smooth. 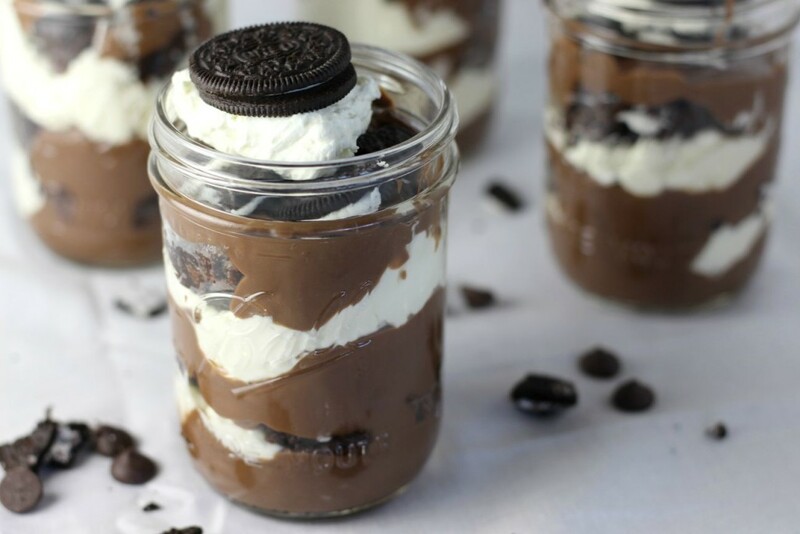 Pour pudding through a mesh siv to remove any lumps, and refrigerate immediately. Preheat the oven to 350 degrees, and grease a 8 x 8 pan. In a medium saucepan, melt together the butter and the unsweetened chocolate. Remove from heat, and cool for 10 minutes. Add in the sugar, eggs, and vanilla, and mix until smooth. Then add the flour, salt, and chocolate chips. Pour into the baking sheet, and bake for 35 minutes or until set. Cool completely. Whip the heavy cream in a large bowl until you have very soft peaks. Add in the vanilla pudding and the powdered sugar, and whip together until you've got stiff peaks. 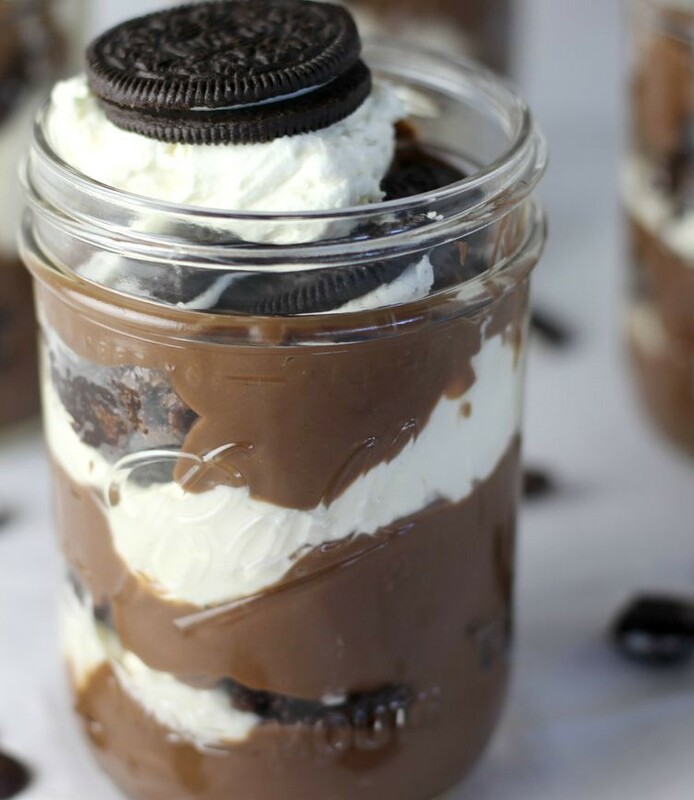 Layer your mason jars with chocolate pudding, whipped cream, brownies, and oreos as you see fit- no judgement here!